George Wiley Paul Hunt arrived in Globe from Silver City, New Mexico, as a young man in 1882. He worked as a dishwasher in the saloons at first, but soon became a successful business man. He owned the Old Dominion Mercantile Establishment, whose building is still located in downtown Globe (it is soon to become the site of a beer microbrewery and old-west style restaurant). George Hunt soon became involved in the brand new Gila County politics and made quite a name for himself. Then, he became involved in state politics, and served as Arizona's first state governor. He served seven (! ), sometimes controversial, terms. Phoenix Valley politicos resented Hunt's Globe partisanship, often calling Globe "Hunt's capital of Arizona." Well, still, Hunt was indeed successful and popular. 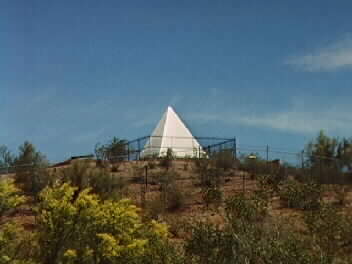 When he died, he asked that he buried under a "pyramid" in the Valley of the Sun. His wish was fulfilled. His tomb is located not far from the Phoenix Zoo.